Wow, hey readers, if there are any of you left. Last I posted a recipe was this past summer. A good one, but not good enough to get you through months of nothing I am sure. Well, it seems life gets in the way sometimes. I will save you the long story and get right to the recipe. I made this recipe up myself and am pleasantly surprised I like these as much as I do. I wanted a chewy and buttery chocolate chip cookie and am surprised I enjoy the taste so much since I prefer my cookies to be a bitter thicker. Maybe next time I will try and increase the flour measurement below by a 1/4 cup and maybe add a 1/4 tsp of baking powder to my next batch for those wanting to change it up before I do. I am posting this recipe as I made them as I think these are a great tasting cookie and my Taste Tester actually loved them. He informed me that he actually prefers flat chewy cookies. Who knew after 3 years together I would not even know he cookie preferences? These cookies, while flat, have a nice buttery taste to them that more than satisfies my cookie craving. I decided to make these festive by adding some Holiday chips and some dark chocolate disks I had on hand but any chips will do. These were so good right out of the oven but still taste great after cooling so I am looking forward to tweaking the recipe as mentioned above to see if I can improve on these already delicious cookies. The cornstarch in the recipe helps to keep them soft and chewy so long as you don’t over-bake them. I do want to point out that the ingredients are a bit different than some other cookies I have made as I start this recipe with cold butter (yep, you read that correct, COLD butter) right out of the fridge. 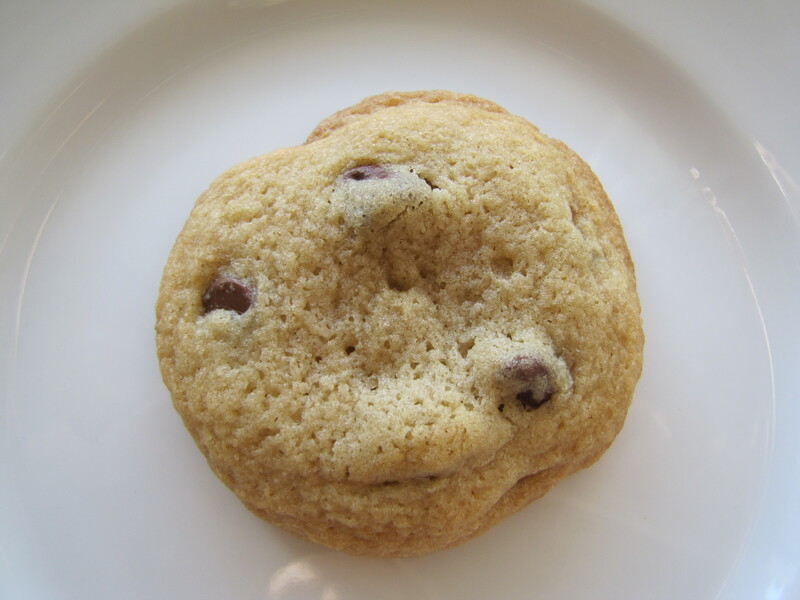 I chopped it up and whipped it good with the sugars which actually beats air into the dough, which, should in theory produce a bit thicker and chewier cookie. That, along with the cornstarch should create a thicker and chewy cookie than what I got but I was not disappointed too much after I tasted them. 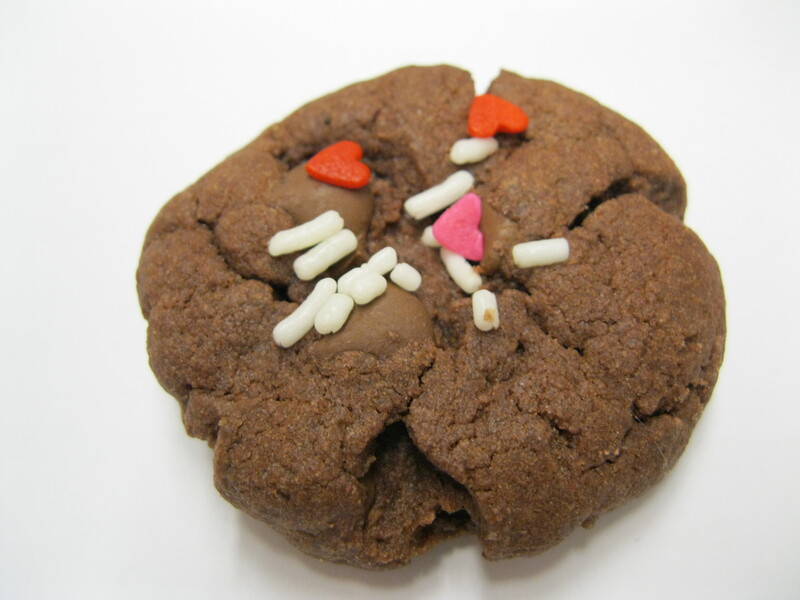 Mine were chewy but failed to be thick due to not enough flour so I look forward to making these again soon but with my tweaks, hopefully creating the cookie I was originally trying to make. Cut butter into 1/2 inch chunks. In a medium bowl, cream together the butter and sugars until smooth (about 2-4 minutes) until creamy (the dough will start to stick together after a while as the butter blends with the sugars, beat until this happens. Add egg and vanilla and mix to combine. Mix in the flour, baking soda, salt and cornstarch and mix until the dough comes together. Bake for 8-10 minutes until golden and set. I love coconut though I do not bake with it nearly often enough. When this recipe popped up in my GoogleReader, I starred it immediately. I love no-bake treats, especially during the warm summer months. I whipped these up over the weekend in no time. The original recipe calls for a 9×9 pan but I opted to use an 8×8 as I wanted my bars a little more substantial and not so thin. I also found that the amount of butter/coconut oil was more than what I needed to completely wet my dry ingredients. I did melt the original amount but only used about 3/4 of it. I would recommend pouring it in and stirring slowly as you may find you don’t need to use it all either. Next time I make these I will cut the amount and see if I can find out the amount that works for me. I also cut the honey down to only 3 TBS as I did not want the flavor to overpower the coconut. I am glad I did this as I did taste the honey but it was not overpowering. After pouring the chocolate over the bars I topped mine with toffee bits. I must say these bars were really satisfying. I liked my modifications so feel free to make these bars you own. I think some toasted coconut on top may be good as well as some chopped almonds. I will be making these again this summer I am sure. My only complaint is these are tough to cut and transport or serve as they do tend to be a bit crumbly unless right from the fridge. Spray a 9×9 pan with nonstick spray. In a large bowl, combine oats, coconut, brown sugar and salt. Heat a small saucepan over low heat and add butter and coconut oil, stirring until melted. Add the butter and oil to the oat mixture, then add the honey and stir very thoroughly until the entire mix is moistened. Press it into the pan and stick in the fridge for 15 minutes. Using the same saucepan that you melted the butter and oil in, add the chocolate and oil and stir over low heat until melted. Remove the pan from the fridge and pour the chocolate evenly over top, spreading with a spatula or spoon. Place back in the fridge for about 30 minutes. When ready to eat, either cut the squares in the pan, or gently lift the square out and place on a cutting board to cut. It helps if the bars somewhat come to room temp before cutting, as they will slightly crumble a bit if super cold! I love a good no-bake dessert, especially during the warm months. I have made a several no-bake desserts over the years and love trying out new recipes. These bars are so super quick to make, take few ingredients and are perfect for a last minute dessert. These bars are a bit like my other bar recipes and no-bake cookies combined. 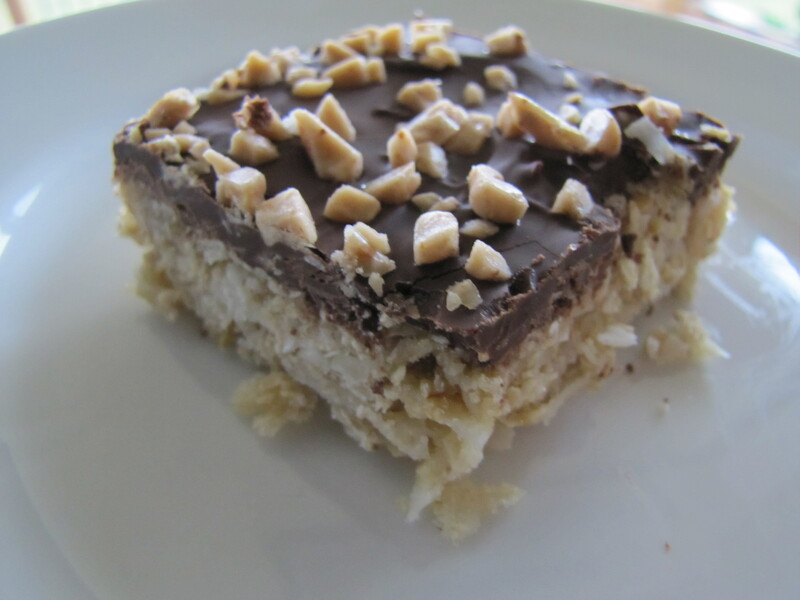 The flavor of peanut butter shines and the oatmeal makes these bars chewy and soft. 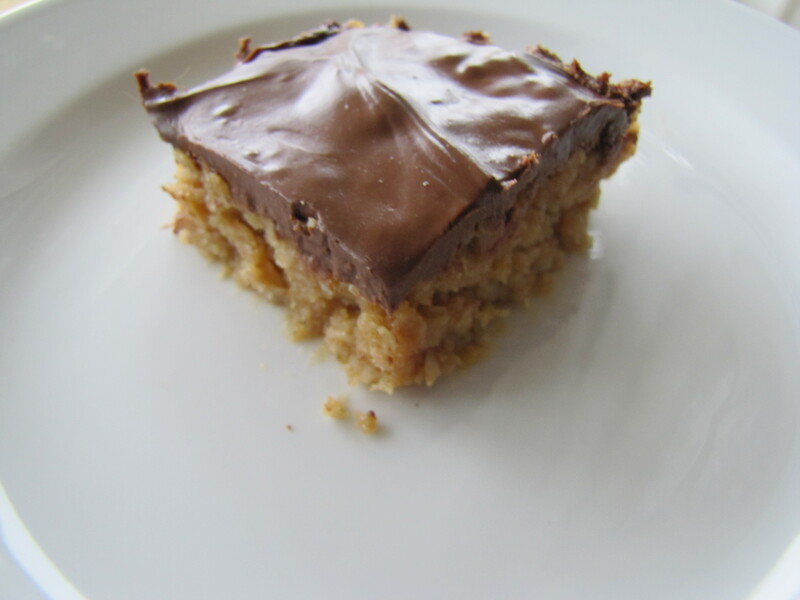 I love the combination of peanut butter and oatmeal and to top it all off a yummy chocolate ‘frosting’. The trick to these is that the mixture needs to boil for about 1 1/2 to 2 minutes in order for the bars to set. If you don’t boil long enough they will still be good, but just really gooey and difficult to eat. You can remedy this by keeping them chilled but just be warned at room temperature they will be messy! I will be making these again when I need a quick dessert, I am rating these an 8.5 only because I do like the other bars a bit better. Lightly spray an 8×8 pan with Pam. In a medium sauce pan, melt the butter, sugar, and milk. Over a medium high heat, bring to boil making sure to stir constantly. Continue to stir and boil for 1 1/2 to 2 minutes after it reaches a rolling boil. Remove the pan from heat and stir in peanut butter and vanilla until peanut butter is melted. Stir in oats. Pour mixture into prepared pan and press lightly and make sure to spread out mixture evenly. In a medium sauce pan, heat chips and peanut butter over medium heat and stir until melted. Pour over bars and spread evenly. Allow bars to set before serving. My Taste Tester is not a big fan of peaches but I decided to give this recipe a go anyway. It was simple to make and I whipped it up in not time flat. 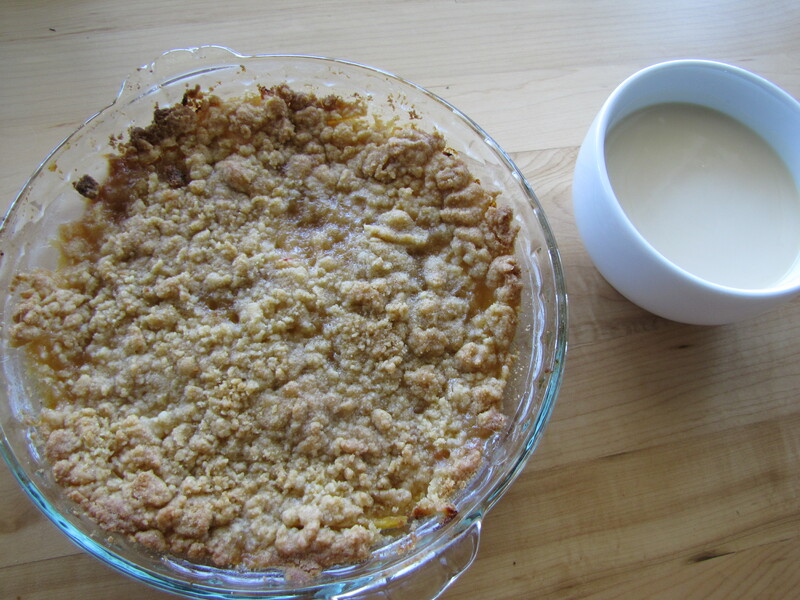 I found the crisp to have good flavor but the the topping did not stay crisp past a day so if you are making this, it is best to serve the day you make it (preferably warm). The sauce was smooth and creamy with a subtle maple flavor. I don’t think I reduced my sauce enough as I thought the maple flavor could have been a bit more pronounced than what it was. I enjoyed this dessert warm with some vanilla icecream. The sauce would be good on a blondie or maybe even pancakes. This was not my favorite dessert and I doubt I will be making it again, but it was nice for a change. I wanted to make some super simple and quick cookies for Valentine’s Day to take to work. I have used a similar recipe before with great results but changed up the proportions a bit. Not sure if I was just in a chocolate mood but these were better than I was expecting. These cookies were a cinch to pull together and I was finished from start to finish in under 30 minutes. I love that this is kind of a ‘cheater’ recipe since you really only add ‘wet’ ingredients to a cake mix. The end result is a rich, thick and chewy cookie that is sure to satisfy your chocolate craving. Feel free to mix up the flavor of cake mix to what ever you have on hand, I am sure they will all be good. In a medium bowl, beat together the butter, oil and egg. Add cake mix and blend well. Fold in chocolate chips or other add-ins. This is a recipe I worked on a very long time ago before I began blogging. My Taste Tester and I were in the mood for some chocolate chip cookies to enjoy while watching a Saturday afternoon football game. After going through several of my recipes I decided to give this one a go as I couldn’t remember how they had turned out when I had made them before. The secret ingredient in these cookies is the cornstarch. I began playing around using cornstarch after my family enjoyed these cookies but I hated the artificial vanilla flavor they had from the pudding. The reason those cookies are soft is due in part to the cornstarch in the pudding mix. I decided to cut out the pudding mix and use straight up cornstarch. The results were very good! These cookies have a tender crumb. Chewy, but not in an underbaked or too cakey sort of way some chewy cookies can be. The crumb is light and tender and the cookies stayed that way for at least 3 days in a sealed container. I found myself commenting how tender they still were days later. My Taste Tester agreed though ate most of his warm from the oven (and by most I mean 8). 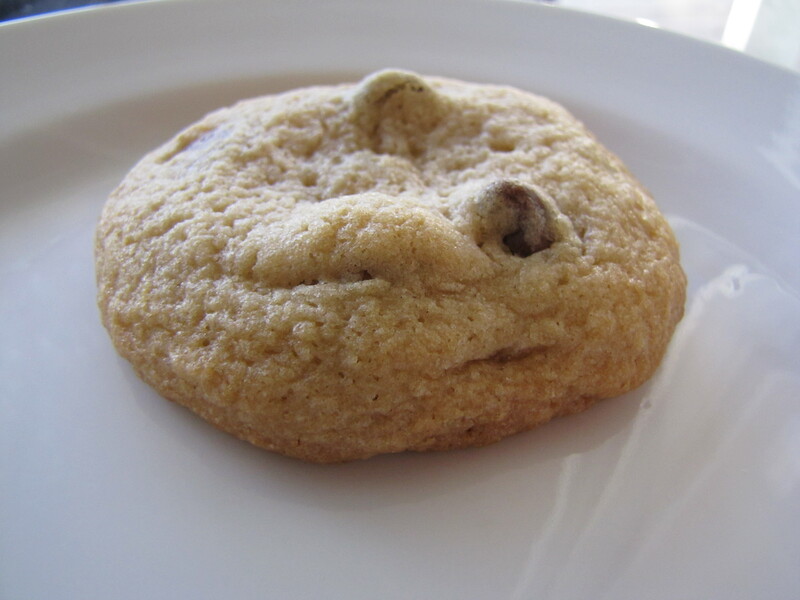 If you are looking for a tender, chewy chocolate chip cookie, give these a try. I must say, the nuts really add something to these but feel free to omit them if you wish. 1 cup nutsPreheat oven to 350. Cream butter and sugars with a mixer until light and fluffy. Add eggs and vanilla and mix until combined. Slowly add the flour, cornstarch, baking soda and salt. Mix just until combined. Drop by spoonfulls on baking sheet. Bake about 8-12 minutes until just golden. Do not overbake. Cool on rack or baking sheet. With summer in full swing we have been enjoying several weekend visitors which of course means entertaining! Yay! While my Taste Tester sticks to grilling up new reicpes, I take the opportunity to try new dessert recipes! With my mom and aunt in town last weekend I knew I wanted to make a cheesecake. Each time they visit I always whip one up and we more than enjoy it all weekend long! This time was no exception. I knew I wanted to use fruit but wasn’t feeling strawberries. 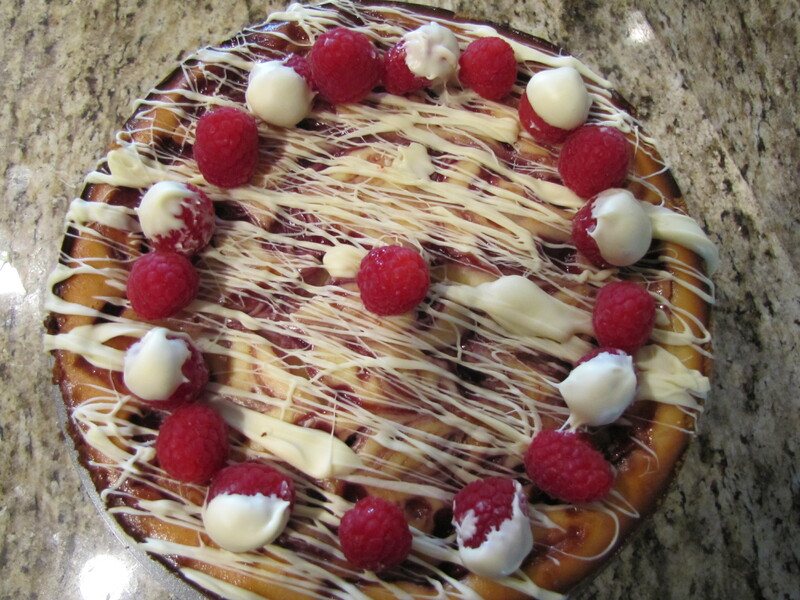 My Taste Tester smiled and said “yes please” when I was brainstorming a white chocolate cheesecake with raspberry swirls. Sold. 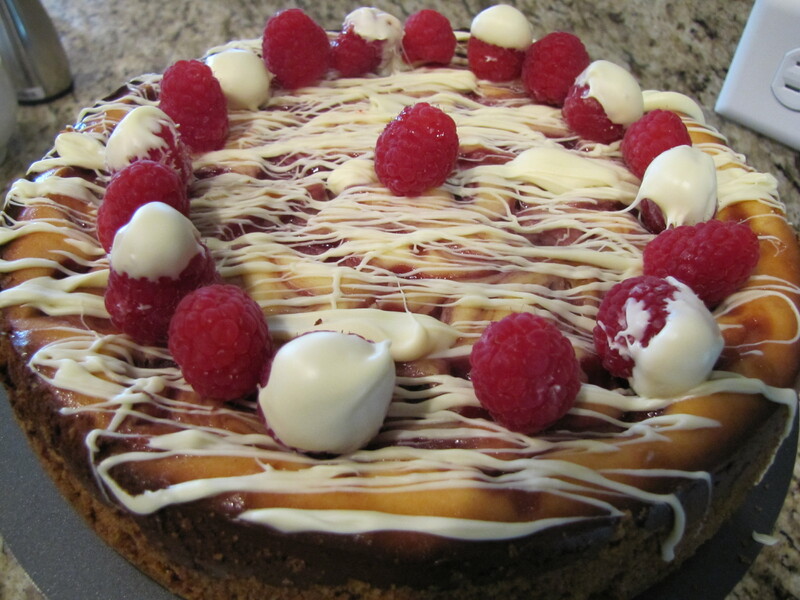 This recipe is based on other cheesecakes I have made over the years. I cheated and used seedless organic raspberry jam instead of making my own. I just didn’t have the time and to be honest, it was great even with the store-bought stuff. If you have time or super ambitious, feel free to whip up your own. If not; welcome to my life and just buy some (good quality of course). The cheesecake itself was creamy and dense (just the way I like it). The white chocolate flavor was subtle but good. I originally wanted to have a chocolate crust (um, hello, chocolate-addict here) but I used a graham cracker crust because the Taste Tester doesn’t care for Oreos. What??? I know. It is the burden I must live with. I was surprised, however, and really enjoyed the graham cracker crust and would not use a chocolate crust in the future unless it was requested. Because I used jarred jam I was able to whip this up and get it in the oven in about 15 minutes, can’t beat that! I also love the fact that cheesecake needs to set in the fridge for a couple days to reach the desired flavor and texture so I made this on Wednesday to enjoy over the weekend. I love not having to rush around last minute when I could be cleaning (yeah right). I would highly recommend this cheesecake, play around with the filling a bit and try another fruit flavor. I do feel that the white chocolate flavor could be a bit more complex so I would like to either add more next time or pick a brand with a more dominant flavor. Let me know if you find a winner! *TIP: I like to line the bottom of my pan with parchment paper and lightly spray with PAM. Adjust an oven rack to the lower-middle position and preheat the oven to 325F. In a food processor, process the graham crackers until you have fine crumbs. . Add in the sugar and pulse. Stir in melted butter. Transfer the crumb mixture to a 9-inch springform pan and press evenly into the bottom and slightly up the sides. Bake 8-10 minutes. Place a baking pan filled half way with water on the bottom oven rack (this will help keep cheesecake moist while baking to help prevent a crack. I like this method better than a traditional water bath) Just make sure there is always water in it while the cheesecake is baking. Melt white chocolate in the microwave in 15 second intervals stirring after every interval until smooth. Do NOT over cook, you can stir lumps out wihtout reheating toward the end. Set aside to cool. In a bowl of a stand mixer, beat the cream cheese to break it up and soften it slightly, about 5 seconds. Continue mixing and add the sugar, sour cream, lemon juice and vanilla. Scrape down the sides of the bowl as needed. Reduce the speed to medium low and add the eggs, 1 at a time. Beat until incorporated, about 30 seconds. Scrape the bowl before each addition. Add the flour and beat just til combined. Add the melted white chocolate and mix until blended. Do NOT overmix. Pour 1/2 the cheesecake mixture into pan. Heat jam in microwave just until easily pourable but not too runny. Spoon 1/2 the jam over the cheesecake batter and swirl with a knife. Pour the remaining batter over the jam carefully. Drop spoonsfull of the rest of the jam over the cheesecake. Carefully swirl but do not go through to second layer or it will not be swirled (just pink). Bake until the center jiggles slightly, the sides start to puff, and the surface is no longer shiny, about 55 to 60 minutes. The center should read about 150 degrees F. Turn off the oven and prop the door of the oven open with a potholder or wooden spoon. Allow the cake to cool in the oven for about an hour. Transfer the springform pan to a wire rack and run a small paring knife around the edges of the pan to loosen the cake. Let it sit to room temperature for 2 hours.